Many of us I expect are familiar with the 1993 Bill Murray film “Groundhog Day” about an obnoxious TV weatherman who gets stuck reliving Groundhog Day, Feb. 2 in Punxsutawney, PA on Groundhog Day, Feb. 2 over and over again. No matter what he does every day is the same day that he has to redo over and over and over. It is as if he has to get it right until he will be allowed to move on finally to Feb. 3. He is gotten stuck in an endless loop, destined to continue on and on into eternity. This film is a comedy, but it seems to me in many ways this film understands and presents a basic truth of the human condition. Our “Sin,” that is our self-centeredness, has caused us all to fall into an endless loop of darkness. And it seems as though we cannot escape no matter what we do. As a result we find ourselves spiraling deeper and deeper into the darkness, estranged from God, from others and even from ourselves. There are a number of examples that we can point to. Various addictions, alcoholism for example, can cause us to enter into this loop. Perhaps it starts with a drink to relax before bedtime, and then a few drinks with friends but next thing we know we are drinking a lot more and things begin to fall apart in our lives and we cannot figure why or what to do about it, and we don't have the strength or conviction to do what we need to do – which is get help to stop drinking. But this is not the only example that could be lifted up as sending us into this endless loop of darkness. There are other addictions that we individually and corporately fall into. And in fact we all have any number of loops that we struggle with, both as individuals and as a society. We are, as a society, addicted to wealth and possessions that we seek after at all costs, no matter who gets hurt; we are addicted to violence; we are addicted to entertainment; we are addicted to being right and getting our own way. And the list can go on and on. Individual and corporate endless loops of darkness that keep us entrapped. The result is that we often find ourselves like Phil Connors in the film stuck in this loop. We can’t get out and we usually begin to find ourselves sinking deeper and deeper into the mire and darkness. This is the human condition and it was not a whole lot different back in Jesus’ day. The history of Israel is in fact a history of selfishness, betrayal, oppression, violence and darkness. Periodically Israel has found itself conquered and controlled by outside powers, such as Assyria, Babylon, Greece, Rome, but this has only made the loop of darkness deeper and darker. And this is the situation Jesus is born into. And when Jesus is presented in the temple the old priest Simeon takes him in his arms and sings “…my own eyes have seen the salvation, which you have prepared in the sight of every people. A light to enlighten the gentiles and the glory of your people Israel” Simeon is saying in effect, this is the solution to the endless loop. God has entered into our world in order to break open the loops that have entrapped is, and to bring light into the midst of this darkness. But it won’t be easy. It never is. 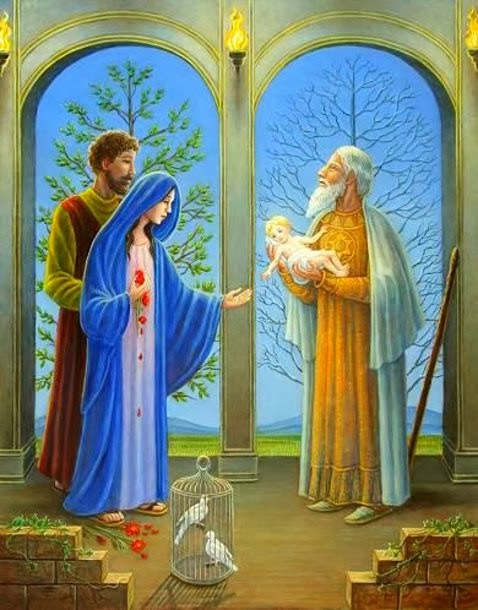 “This child is destined for the falling and the rising of many in Israel, and to be a sign that will be opposed so that the inner thoughts of many will be revealed—and a sword will pierce your own soul too.” Simeon speaks these words to Mary. And these are words of truth for us as well. God has called us to light, but (let’s face it) we prefer the darkness (as John says). It is familiar and it is comfortable. We may realize that we are in an endless loop of darkness and that it is destroying us, but at least it is a familiar loop, a familiar darkness. Whereas the light offered by Christ is unfamiliar and scary. If I begin to break my dependence on alcohol, or money, or possessions or this or that – what will life be like? If I begin to open my heart to the light of Christ that shines in me what does that mean about my favorite prejudices and priorities? Last week I used the image of a lighthouse to describe what God does for us at Baptism. We are like a lighthouse where God has lit the light of Christ in us at our baptisms and this light is shining forth from us automatically because of the love and grace that God has showered upon us. But we can do things to the light – we can do things to help the light shine brighter and farther. But we can also do things to squelch the light, to limit the light and even to block it out. Today we remember that Jesus was presented in the temple to God as the light of God’s love and grace which shines forth in the darkness and we have the opportunity to recommit ourselves to this light. To seek after ways to help this light shine forth in our lives, thus working to break the various endless loops of darkness in which we have gotten ourselves entrapped. And so rather than being stuck repeating the same day over and over again we are rather, led by the light and sustained by the presence of Christ. For in Christ each and every day is a new day!